Taylored Expressions released this Wreath Cutting Plate in October. I.HAD.TO.HAVE.IT. 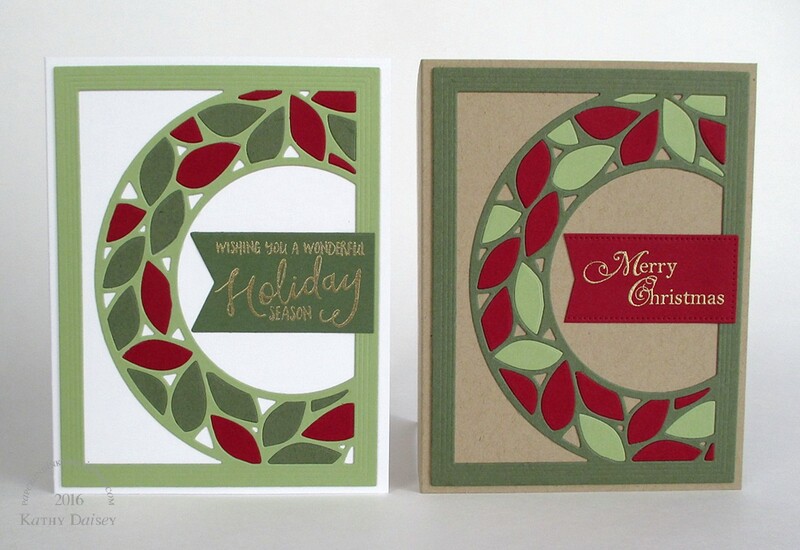 I was online EXACTLY at 10:00am EST to order this cutting plate and the Peaceful Poinsettia Embossing Folder. Odd how I didn’t use it for over a month. (insert exasperated sigh) In my defense, October was busy on its own, and I got thrown a few family health curve balls. (No worries, all is well.) And I knew exactly what card I was going to make first. 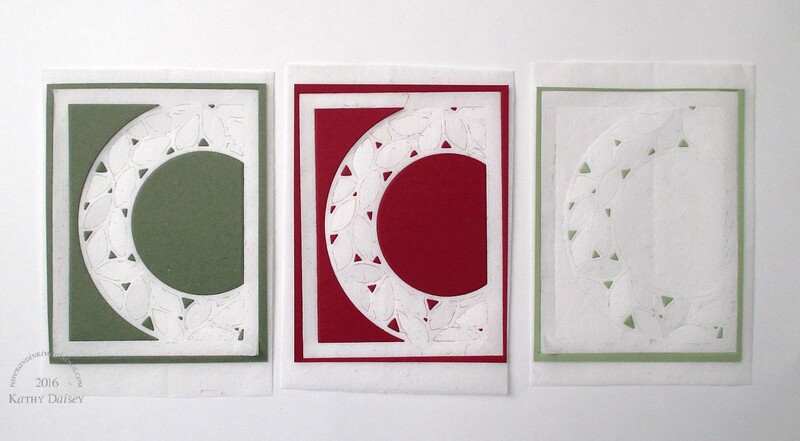 I cut three colors of cardstock with the cutting plate, placing each color of cardstock on top of a folded dryer sheet, to help keep the pieces together when removing the die from the paper. Then, I mounted the frame parts on cardstock (white or kraft). With my trusty Ranger Multi Medium Matte bottle in hand, I glued individual pieces into the frames. Supplies: Stamp – Essentials by Ellen, Stampin’ Up!, paper – Neenah Classic Crest Solar White, Papertrey Ink Kraft, Stampin’ Up! Always Artichoke, Cherry Cobbler, Pear Pizzazz, ink – VersaFine Vintage Sepia, dies – Lawn Fawn (tag, with tag detail cut off), My Favorite Things (pierced rectangle), Taylored Expressions (wreath cutting plate), embossing powder – Stampendous Gold Detail, gold cord – PaperMart. 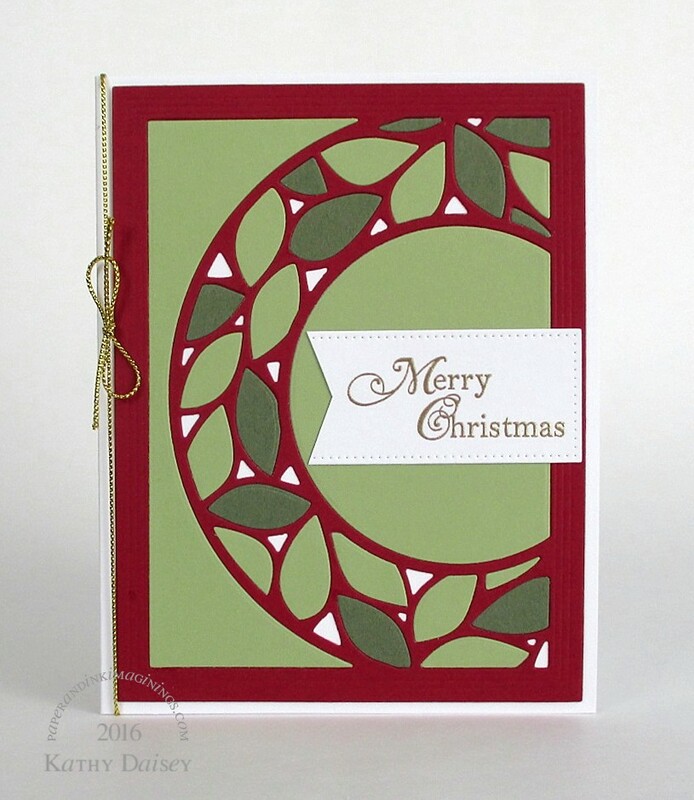 Categories: card, holiday | Tags: card, My Favorite Things, Neenah, Paper Mart, Papertrey Ink, Ranger, Stampendous, Stampin' Up!, Taylored Expressions, Tsukineko, VersaFine | Permalink. I LOVE this! So classy and so effective too. Thank you! I can see every holiday in this wreath, can’t you? Actually yes, now you mention it. Change the colours, add some embellishments if you feel like it… Good purchase, I think! Wow! All these cards are so pretty and stylish! Love this design and the colors you used for them! Thank you, Regina! I really like this cutting plate!